I didn't think I'd write here for a long, long while. I didn't see the point; I felt disheartened, disillusioned, broken. I had NOTHING positive to write about. And I knew there was no good to be had in spreading the negativity. The world has enough of that already. I completely stepped away from all forms of social media for about two weeks. While that might not seem long to some, or so very long to others, for me the lapse was what you'd call a 'significant' break. I'm not a huge 'twitterer'. But I check out Facebook at least once a day. I visit my blog every day. I'll occasionally sign in to LinkedIn. I check my hotmail every few hours without fail. I scan Mail OnLine because I secretly enjoy the trash. I lurk on my favorite blogs for sheer entertainment and because I've actually become 'friends' with their authors ... these strange, hilarious, sad, engaging, amazing kindred writer souls. But for the last two weeks, I just stepped away. And it actually felt good/great. It felt like I was a newborn, rediscovering my thoughts; actually having to sort them out before spewing them out. You see, I'm a thinker, then a writer. But I'm not much of a vocalizer. So for the last two weeks, I've actually had to run things through my brain and work through them ... without blogging or talking. Just thinking. And since there was (virtually) no social media input, all I had to think about was me and my life and all that's in it. There's something to be said about that. But a few days ago, like every good addict, I decided I wanted a little bit 'in'. My fast was over. I checked out one blogger friend in France, and found she'd suffered a great loss. One as great as mine, perhaps more. Perhaps unexpected. I realized I hadn't been around to ask. I checked out my blog comments and found that another blogger buddy understood what 'ME fatigue' is all about. (anyone living in the Middle East will understand the inexplicable 'tiredness') But more than that, he really 'gets' living in the ME as an expat. The whole 'love-hate' relationship. Not everyone does. My best blogging buddy (3B) who's followed me since I was a 'baby blogger' has been dealing with an injured spouse while celebrating a newfound calling. Empathy and congratulations were in order. My best friend in the world, the one who was my roommate for four years in university, the one who consoled the inconsolable when I got separated, the one who always assured me it would "be all right", the one who drove hours to see me when I was visiting my dying father, the one I love to the ends of the earth and beyond ... well, she just found out her mom has cancer. I need to be available ... just in case she needs me. Smilin' Vic's step-mom is undergoing chemotherapy ... it's not looking great. I realized that when I opened my e-mail three days ago. My brother-in-law wants to make me laugh so he sends funny fart jokes and the occasional positive social interest piece on Qatar. He e-mails. My sister, my mentor, sent me a few messages. I opened them today. They were sent a week ago. On WhatsApp. Forgive me for my weakness, but I have quickly realized that an expat in Doha fares far worse without social media. Unfortunately, my addiction to fibre-optic connectivity is a lifeline to what moves me. It is a lifeline to what matters. The key most likely resides in balance. Balancing the NEED to communicate and the DESIRE to be heard. There's no need to be in constant contact. But there is a need as an expat to be 'reachable'. 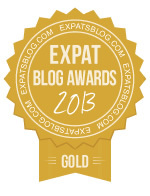 There is a need as an expat to 'reach out'. 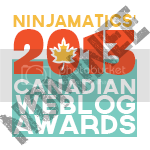 This blog is no place for negativity. For reflection, yes. For appreciation, yes. For a good laugh, yes. For a healthy rant, yes. But not for negativity. And so I've resolved to respect it for the healthy outlet it's meant to be. Tonight I broke completely, like the true addict that I am, and was rewarded with a satisfying rush - a good news story, about Qatar to boot! A story of one (caveat: not the 'only' one) Qatari making a difference. Changing the world, one gesture at a time. That one Qatari made a difference. That one Qatari moved me. I was moved. Truly moved. Moved to the point of wanting to write about something positive again. Despite the disparaging comments questioning the authenticity of the intent. Despite the naysayers insisting that it's all a publicity stunt. I insist ... actually I KNOW, that there is inherent good in every society. My previous rants, my disparaging comments about dissatisfaction in this country ... they're justified. Through the eyes of a North American expat, they're justified. But they're not fair. They're my perception of a society, a Nation, trying to come to grips with Westernization. And who am I to say the Western way is THE way? All I can say in my defense is that I struggle with what is unfamiliar to me. Even after eight years, I struggle. Which gives all the more credence to my hosts, who struggle every day to adapt to the expat population that engulfs them by approximately 85%. I can at least plead the frustration of a 'foreigner in a foreign land'. But imagine being a minority and a foreigner in your homeland. Imagine. This is your HOME. And the world, the worldwide scrutiny, the wealth, and the media have taken over. You have no place. The world has tried you; you are wrong, you have done wrong, everything you believe in is wrong. What do you do? Kudos to individuals like Hamad Al-Amari and Fatima Al-Dosari for trying to merge those worlds. What did they do? A little something. A little something to make you 'Happy'. I work with some very cool dudes. Some Nationals who hang out with me and love a good laugh and song. Some very respectful, respected, respectable individuals who actually want to see the WORLD, not just Qatar, be a better place. Like the guy I know who went back to the Philippines last year to visit his childhood nanny, because he missed her, but also to see how he could help her and family. Living here is not easy. I don't always 'get' it. Often I want to go home. But that's my thing. On the flip side, I admit to feeling personally offended when I read or hear of outsiders or newcomers trashing this country. Everyone has some good in them. They just don't always 'get' it. Forty years ago, North Americans were driving 140 miles an hour down the highway with a kid bouncing around in the front seat and a case of beer at their feet. We've evolved ... most of us ... to an extent. This is wayyyyyy past due. But I thought it was worth posting. Just in case there are any "true blue", "tie-dyed" Tom Jones fans out there. Waiting in line ... proper polite British cue ... no shoving! Unfortunately I couldn't upload my clips because they are incompatible and too big for SquareSpace and I'm too un-tech savvy to fix the problem. But here's the YouTube link to "Tower of Soul" ... which is just one song that makes this man the legend that he is. So many things about this "home and native land"* always seem so foreign and/or striking upon returning to my homeland after months in the ME. "I'm an alien, I'm a legal alien, I'm an expat in Canada." the clash of an abaya-clad lady standing shoulder to shoulder with a granny in a fake tan, stilettos, leggings and a tube top in the Customs line. the welcome being broadcast over the airport PA system in French and English - "Welcome to Montreal", "Bienvenue a Montreal". Not a single "Marhaba". the absence of 300 listless laborers disembarking a single flight from Sri Lanka with nothing but a plastic grocery bag as a carry-on. Then there are the more subtle things. One thing that surprised me is that there is now a "National queue" for Canadians at passport control/customs. In the past, Canada has likely prided itself on political correctness by excluding everyone from fast-tracking customs. Nonetheless, Pierre-Elliott Trudeau Airport now boasts a "Canadian Residents" line. Fat lot of good that does me. I am a citizen, yes. A resident, no. My chances at ever making it into one of those fast-track lanes seem to have been foiled again. I WANT a fast-pass lane!!!!!! I wind my way slowly through arrivals with an army of in-transit passengers, vacationers, business travelers and newly landed immigrants. I show my passport to the customs officer ... He asks me what the purpose of my visit is; I explain that I needed a breath of fresh air, a reconnection with family, a proper fix of Tim Horton's. Judging by his flat expression and blank stare, my attempt at levity has gotten me exactly nowhere ... some things are actually quite similar no matter where you're traveling to. "I'm on vacation", I retract ... He writes a code on my immigration card. I can never remember which code will get me directly through the arrivals gate and which will get me frisked. I find out soon enough that today's code is a pass. I am off to meet my family! But first I must collect my bags ... not a porter in sight. Unlike Doha where there are dozens of porters standing by the luggage belts actually anticipating carrying your luggage with glee. I WANT a porter!!!!!! I wait 45 minutes for my bags to come around on the carrousel. It is about 1.5 hours after landing that I finally get to hug my sister and gulp in as much fresh Canadian air as I can before stepping into the car for the ride downtown. I'm coming from a country where sidewalks are for parking and cycling (not the leisurely kind of cycling; the laborer on a banana bike type). Nary a pedestrian to be seen. People just don't 'walk' to get around in Doha. In downtown Montreal, the sidewalks are teeming with folk of all ages, all walks of life. Here a teenager jogging in short shorts and a t-shirt; there an elderly couple taking a leisurely stroll; across the street a few smart-dressed professionals having a smoke the obligatory 10m away from the front of an office building. The bustling, the vivacity, the eclecticism of it all is enough to give me a feeling not that unlike brain-freeze. It is truly, truly invigorating. You'd think I'd be used to the dust, the stuffy sinuses and the mild yet ever-present cough after seven years in the Land of Sand. I guess in a way I have become acclimatized to a degree, because as I head out to pound the pavement that first afternoon, the fresh air is like an assault on my system. I swear, it's almost like I can think more clearly, despite coming off a 13-hour sleepless flight and having been awake for close to twenty hours. The rush of oxygen to my brain those first few days seems to ward off the jet lag remarkably fast. Where are all the beads and sequins? Even though the national dress in Qatar is the abaya (traditional long black gown worn by women over their clothing when going out in public), many of these are festooned with beads, pearls, embroidery and sequins. Women who don't wear the abaya tend to wear bright colors, sparkly tops, leopard print skirts and the like. Montreal, while extremely cosmopolitan, is a much more 'muted eclectic' on the fashion front. Note that this is not necessarily a bad thing. Is wearing shoulder blades, bare knees and pierced navels in public actually legal? You just can't help it. No matter how overtly liberal you may consider yourself in the ME, no matter how emancipated and moderate the ME country you are living in may seem compared to others in the region, after a few years as a ME expat you will become overly sensitive to the sight of exposed flesh striding down the street in broad daylight. Crop tops, tank tops, tube tops, hot pants, barely there skirts and crack-baring jeans are a visual onslaught. The desensitization only takes a few days, but it the meantime it can be highly disruptive when driving or trying to hold down a conversation. Did I actually just pay taxes on picking my nose? EVERYTHING is taxed in Canada. Sometimes the tax is built-in (e.g. for gas), but sometimes it comes as a big fat surprise. (I know, I know, it's not like I've never lived here before, but it still comes as a shock when you've been away for so long.) You will be charged a provincial and a federal tax on pretty much everything you purchase, from that takeaway pizza to that early-morning coffee to that trip to the salon. I could go on forever: the assault of green on your senses when you've become acclimatized to beige, the thrill of rain drops replacing dust particles, the sound of church bells ringing in the distance, the surprise and slight discomfort at understanding every single conversation going on around you, etc. The But my point is simply that cultural adjustment is not a one-way trip. Just when you think you've got the expat acclimatization halfway sorted out, you realize you will likely one day have to make the return journey and start all over again. Below are a few images of some other differences spotted while on our last trip. Hope you enjoy. *Reference to "Oh, Canada", the Canadian National Anthem. 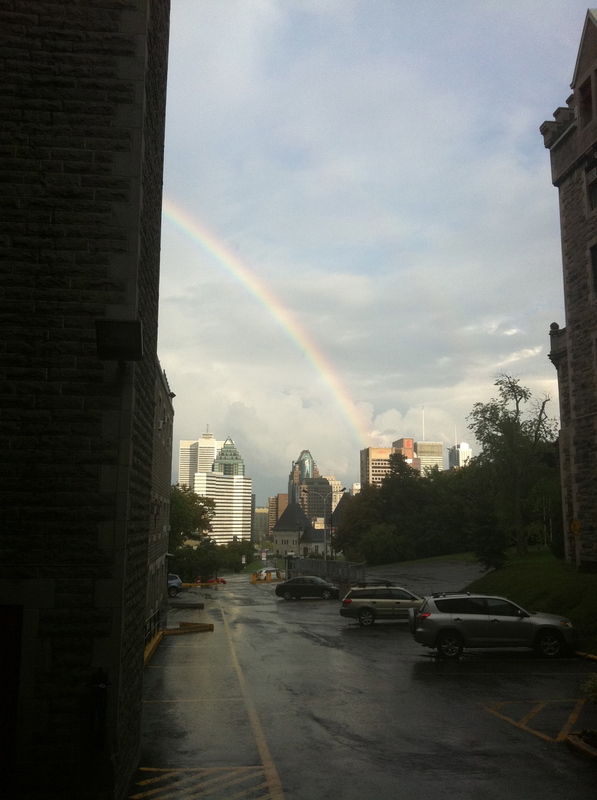 Rainbow over Montreal after a downpour. Blue skies over Qatar. The sky is usually more beige than blue. Decidedly unhealthy "poutine" in Quebec. (poutine = french fries, gravy and curd cheese). Getting fish ready for a healthy meal in Doha. A bottle of water costs about 0.33$ in Qatar. 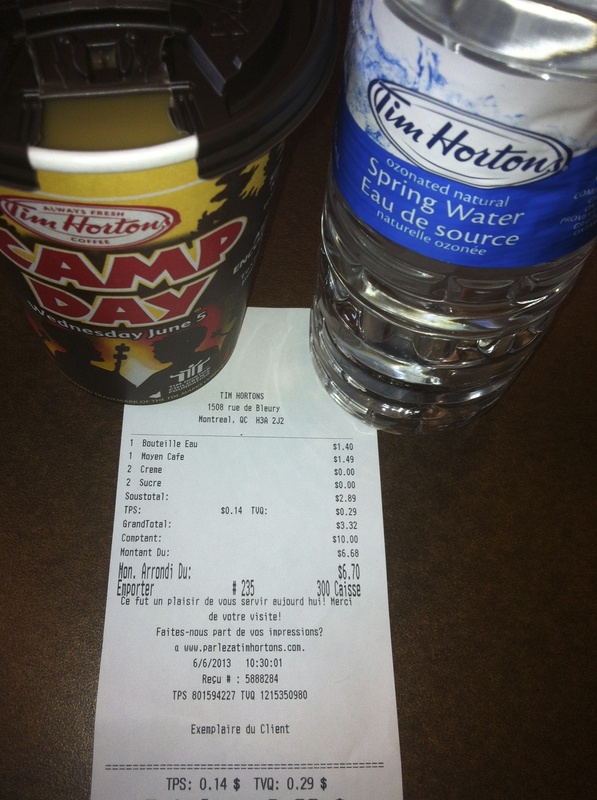 In Canada it costs as much as a coffee ($1.40 + tax). You'd never think Canada is listed 3rd on the world's renewable fresh water reserves list. Stop sign in English and Iroquoi (on the Kahnawake reserve). Stop sign in French only in Quebec. 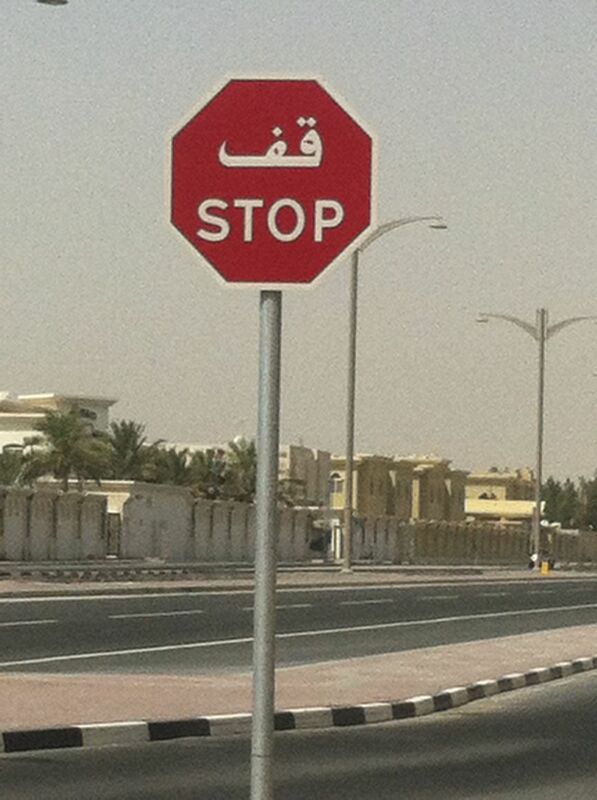 Stop sign in Arabic and English in Doha. Maple Bacon in Canada. Words truly fail me (this stuff is sinfully delicious). Bacon in Qatar (yes, we can actually get pork products now, but once this stuff is done it basically just tastes like fried salt). Road leading from Dukhan to Doha. Warming up to a roaring Canadian campfire! And last, but not least, Canadian Tire money!!!! !